Trial & Error had a really great premiere. It was full of jokes and had a great plot. It set up a very interesting story and it looks like it will be a lot of fun to watch it unfold. 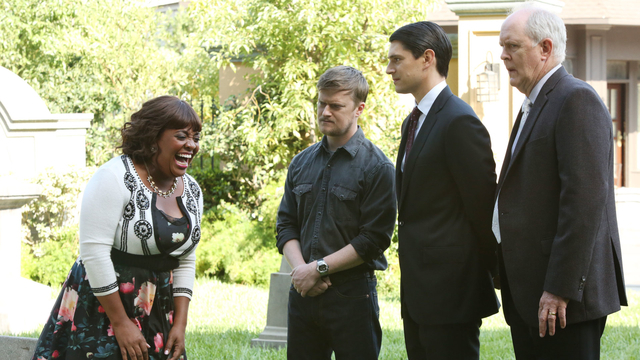 The episode begins at the cemetery, where Margaret's headstone is unveiled. Larry hates the grave, because tulips are planted at it, and Margaret hated tulips. Anne arrives at the cemetery, and she starts laughing when she is reminded that her grandmother is buried there. It turns out that the tulips were planted there by Jeremiah, specifically to torture Larry. At the unveiling, Jeremiah is allowed to speak instead of Larry. When the stone is unveiled, it says that she was "Taken Way Too Soon/By Larry Henderson." Back at the office, Carol Anne arrives, and she sees the team's case board. She gives Josh their evidence in the case, and she also drops off her guinea pig to for taxidermy, and the way she describes how she wants it prepared is hilarious. At Larry's, Josh and Larry try to figure out who Margaret was having an affair with. Larry starts asking Josh personal questions, and Summer comes in. He reveals that he was previously engaged to another lawyer, but they broke up and he's over her now. Larry gives Josh a book that he wrote. Dwayne and Anne find a footprint that was supposedly left by Margaret's lover. They act how they think it was left on the wall, and it was hilarious. Anne says that she'd know that the foot anywhere, and that it's Detective Rutger Hiss, who is the lead detective in the investigation. If they can prove it, this will be a huge break in the case. At a tavern, Larry and the team discuss the case. Josh tries to convince Larry not to confront Rutger. Josh sees Carol Anne, and he gloats about their findings. It turns out that Rutger was Carol Anne's lover, too. Josh shows Carol Anne Larry's book, and asks if she thought the man on the cover (Larry) was capable of murder. At the office, Summer tells Josh that she hasn't seen Larry in a long time. "Larry" was brought back to the office by Anne, though it turns out that she kidnapped some other guy. They then see Carol Anne on TV, and she has Larry's book, which she stole. There is an incriminating line in it about a shattered window, and even the random guy Anne brought to the office knows this isn't good. Josh goes to Carol Anne's office, and he confronts her about the book. He starts to get in her head, and she almost kisses him. Josh then notices the guinea pig in the rocking chair, and it's pretty adorable. 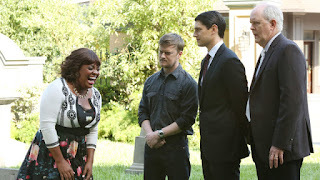 Josh figures out that Larry is at the cemetery, and he is digging up the tulips. Josh tells Larry that his poem was read on TV, and Larry gets really excited. Dwayne heads to Rutger's house, and he finds him in a coma. This was another great episode. I really enjoyed a lot of the jokes and the gags, but my favorite was the gag about the guinea pig in the rocking chair. The episode begins where the last one left off. Officers arrive, and Dwayne explains that he didn't contaminate the crime scene. He just touched everything and put Rutger's gun in his pocket. At the courthouse, a fan of Larry's arrives and wants an autograph. She seems a bit unstable, as Summer points out. At the trial, Josh asks for evidence collected by Hiss to be thrown away. Carol Anne shows the judge the coroner report, something Josh has been asking for but was never shown. It turns out that Margaret was hit in the head with something before being pushed through the window, and Carol Anne believes it to be one of Larry's "titanium trekking poles", and one of his just happens to be missing. Rutger was injured the same way that Margaret was. Larry is then thrown in prison for the attack on Rutger Hiss. Josh and Larry start discussing what Larry did the night before. He continually brings up "that hit and run he got away with" and uses "prison language". At the office, Josh and the team try to work out a timeline. He doesn't think that Larry was able to get from the hardware store to Rutger's house in less than a half hour. Anne comes up with an idea to talk to a pet psychic to find out about the murder through Shakespeare the dog. At Rutger's house, Josh and Summer spot a security camera. He has the judge and Carol Anne look at the camera's footage, and they see Dwayne on the camera. Dwayne is thrown in prison. Dwayne explains to Josh why he was at Hiss' house. He broke into his home to use the restroom, and he never even saw Rutger. At Larry's house, he finds his fan from earlier in the episode in his house. She asks him to read a poem, but she creeps him out and he wants her to leave. He eats an empanada that she made, and she watches him from outside. At court, Josh states that Rutger had an allergic reaction. Since Josh had whitefish in his bag, he's thrown in prison. Dwayne, Anne, Summer, and Larry try to help get Josh out of prison. The team notices a body cam on Rutger in his picture, which could help to figure out how Rutger entered a coma. Carol Anne is talking with Josh, and she wants him to leave Larry's case. After Carol Anne leaves, Larry's fan appears. Josh immediately asks the guard to make her leave. At the office, the gang views the body cam footage, and they find out that Rutger stole Josh's sandwich, and Josh did not poison him. The judge allows Josh to go free, and also rules that evidence collected by Hiss must be thrown out. Later on, Anne brings a pet psychic to Larry's house. Shakespeare finds the walking stick. This was yet another fantastic episode. I loved how Dwayne, Larry, and Josh were all arrested for Hiss' murders before eventually being proven innocent. This show is very consistent with its gags in each episode, and I really love that. Now that more about the murder has been revealed, do you think Larry is guilty? Vote in the poll below and let me know your thoughts in the comments below.